A new version of the popular Swype virtual keyboard has come, and it introduces the long-awaited automatic updates, and adds more languages to the mix. The nice part is that Swype has support for HD 720p displays now, like those on the Samsung Galaxy Nexus, or the LG Optimus LTE, but support for devices with Android 1.6 and WQVGA resolution has been dropped. The company got acquired for $100 million by Nuance recently, the guys behind the speech-recognition technology used in the Siri voice assistant software in the Apple iPhone 4S. Automatic Updates have finally arrived! Once installed, this latest version of Swype will let you install updates on-the-fly via Swype Connect. When an update is ready, you'll receive an Android Notification informing you that an upgrade is available. Install the update right through the Swype Settings window. Your user dictionary and settings will automatically be saved during the update! Improved Language Control gives you access to only the languages you use. From Swype Settings you can select which languages will appear when switching languages directly from Swype. Never cycle through a language you don't use again. The Nuance acquisition is predominantly meant to add more functionality to the accompanying voice-recognition software, like it learning from your typing pattern the way you spell certain names, and acting accordingly when you out a voice command, for example. Well, we'll see how this goes in the future. I'm so not thrilled for now. SGSII for real!!! My Swype keyboard is stuck in Spanish and it won't come out. I can't update it. Totally lame. This should really be released for Windows Phone. Hey, how do I update Swype? I'm on version 3.21.87 and I can not find anything in the options to update, and I did not see a link in the android market. Any help would be appreciated. Skype is awesome I wrote this comment in seconds with the use of one finger now thats efficient! is this available in android market? go to swype.com and register there... you will have to download it as an "unknown source" app. Make sure you have that box checked in your settings so you CAN download it. If your phone cannot download "Unknown Source" apps, root your phone. 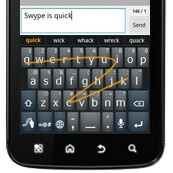 Man I love swype as it is a huge time saver!! What's up with this I found in bold bright letters on their site "If your phone came pre-installed with Swype DO NOT download this beta (it won't work)". That is total BS! !